Victor tote kit without tanks design features an ergonomic carrying handle, built-in storage case and a functional balanced design. Each outfit includes the components needed to tackle jobs from light duty welding, to specialized brazing, to cutting steel. Victor commitment to quality and safety are built into their outfits. Top Quality Our cutting torch and welding kit adopt high quality strong materials with heavy duty construction.Durable and sturdy for use.The set includes oxygen regulator,torch handle,acetylene regulator. 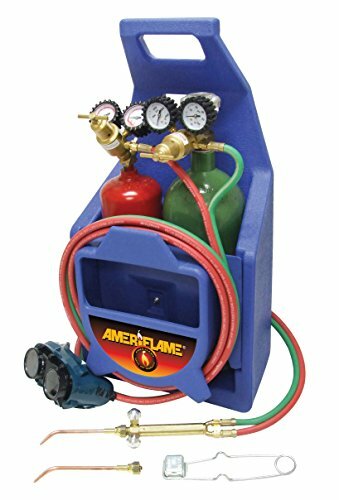 Outstanding Performance The oxygen & acetylene welding kit enables you to cut up to 6 and weld or braze up to 1/2 with appropriate tips. Full 2 1/2 diam high capacity oxygen and acetylene regulators provide optimal performance. Considerate Design The welder tool set comes with readable and legible dual scale 2-Inch gauges.And a large brass handle is designed for smooth,accurate adjustments. 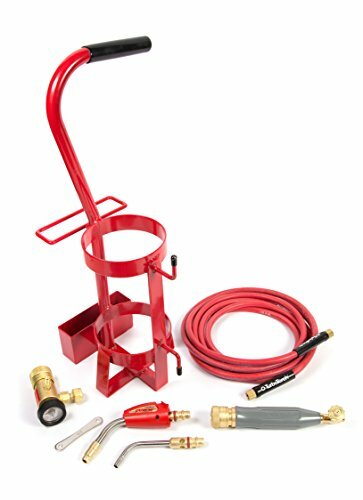 Complete Accessories The portable oxy brazing welder features with hoses,welding and cutting torches,goggles,tip cleaners and spark lighter.There is a heavy duty molded storage case packing a spanner for easy carrying and transport. 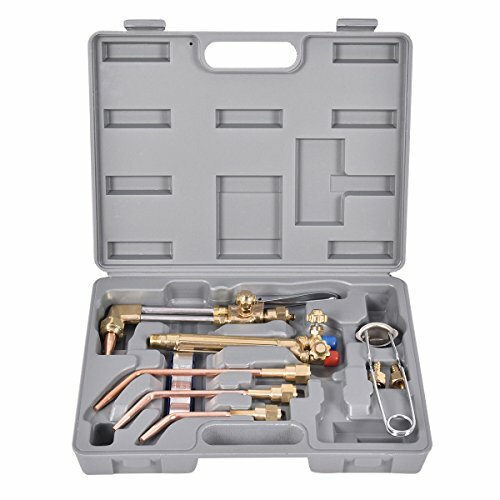 Wide Range Uses The gas welding kit is perfect for amateur metalworker or seasoned professional with business or home application.Ideal for many occasions such as welding,soldering,brazing,rivet cutting,hard-facing and metal heating process. A lightweight medium duty portable welding/brazing outfit with carrying stand. For commercial heating, ventilation, air conditioning and plumbing applications. Unitized packaging includes Oxygen and Acetylene cylinders (shipped empty). 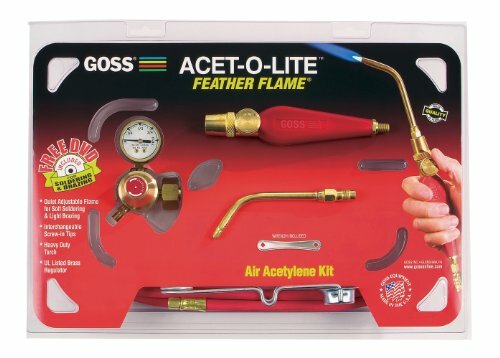 Kit includes Goss's most economical priced air-acetylene tips. Their design makes them inexpensive while still producing excellent flame characteristics. 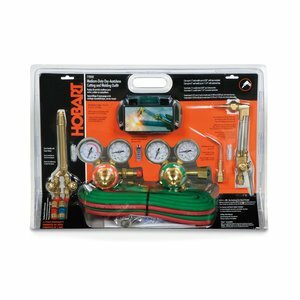 Soldering kit includes HA3-12 hose, B Acet regulator, AA-1 handle, BA-3 3/16-inch tip producing soft solder of 1/4 to 1/2-inch, MP-1 lighter and MA-2 wrench. 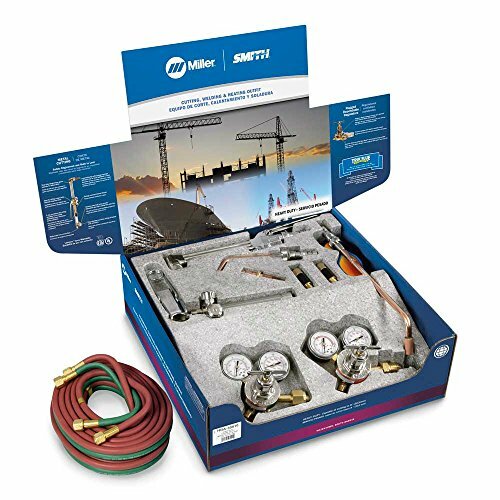 This Is Our Brand New Complete Oxy Acetylene Welding And Cutting Kit, Which Handles A Broad Range Of Cutting, Welding, And Heating Applications. The Whole Kit Is Made Of Heavy Duty Metal And Brass, Offering Years Of Durable Use. Comes With Copper Pipes, Welding Pipe Connector, Cutting, Aluminum Pin, Iron Chrome-Plated Igniter And Copper Joint Packed In A Heavy Duty Molded Storage Case. This Kit Is Perfect For An Amateur Metalworker Or A Seasoned Professional. 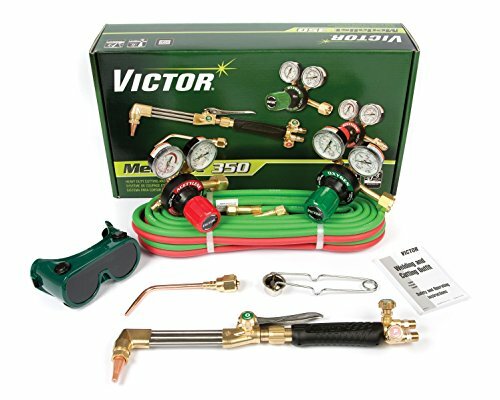 Efficient for Welding and Cutting -- This gas welding torch kit is designed for a broad range of cutting, welding and heating applications, which is also easy for you to use with precision and efficiency. Durable Use --The whole kit is made of heavy duty metal and brass, offering high strength, durability, longevity and precision. This welder tool set is great choice for an amateur metalworker or a seasoned professional. Blow-molded Case -- All parts are organized well in a heavy-duty plastic blow-molded case, which is convenient for storage and transportation. You could take it anywhere work needed. Easy Use --This tool kit makes much easier for your welding work. A neutral flame creates carbon dioxide that purges air from the heated metal for easier cutting and welding. 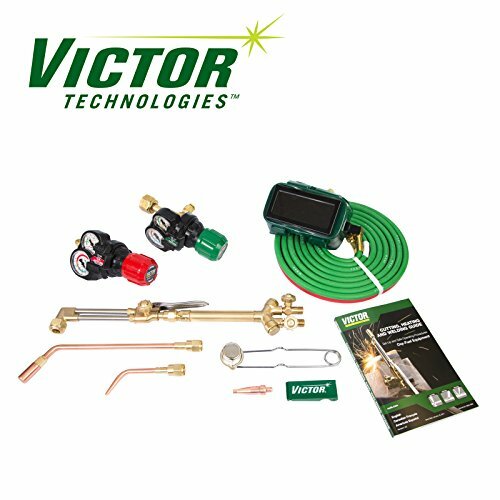 Packages Includes --The whole kit includes 1 storage case, 3 copper pines, 1 welding pine connector, 1 cutting, 1 aluminum pin, 1 iron chrome-plated igniter, 2 copper joint. This heavy duty system cuts up to 3/4" (19.1 mm) or 8" (203.2 mm) with optional tips. It welds up to 1/2" (12.7 mm) or 3" (76.2 mm) with optional nozzles. This Is Our Brand New Complete Oxy Acetylene Welding And Cutting Kit, Which Handles A Broad Range Of Cutting, Welding, And Heating Applications. 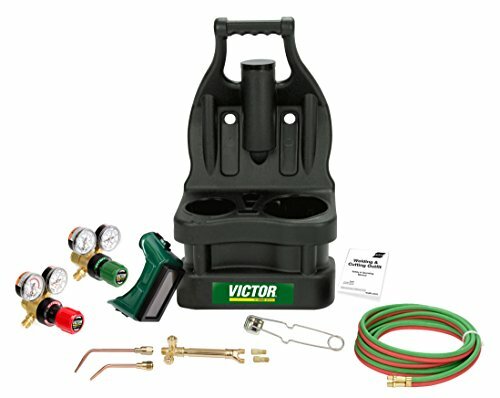 The Whole Kit Is Made Of Heavy Duty Metal And Brass, Offering Years Of Durable Use. Comes With Copper Pipes, Welding Pipe Connector, Cutting, Aluminum Pin, Iron Chrome-Plated Igniter And Copper Joint Packed In A neat divisonal Storage Box. 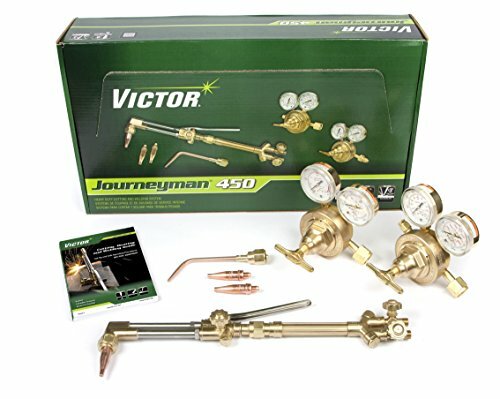 This Kit Is Perfect For An Amateur Metalworker Or A Seasoned Professional. 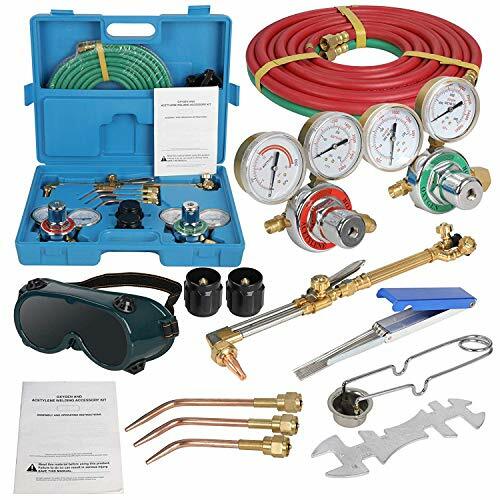 Packages Includes --The whole kit includes 1 storage box, 3 copper pines, 1 welding pine connector, 1 cutting, 1 aluminum pin, 1 iron chrome-plated igniter, 2 copper joint, 1 wrench, 1 welding goggles. Divisional Neat Box -- All parts are organized well in a divisional neat box, which is convenient for storage and transportation. You could take it anywhere work needed. This heavy/medium duty system cuts up to 3/4" (19.1 mm) or 6" (152.4 mm) with optional tips. It welds up to 1/8" (3.2 mm) or 3" (76.2 mm) with optional nozzles. 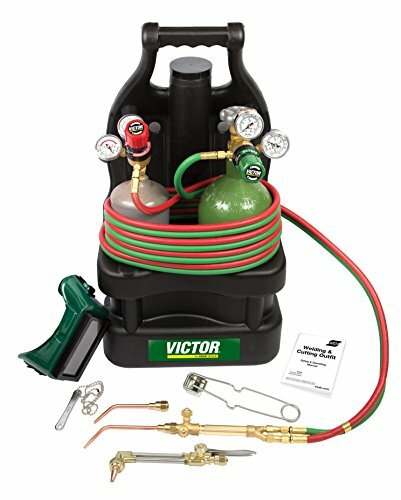 Includes: Heavy duty construction; G350 Series regulators; WH411C torch handle with built-in check valves; CA411-1 cutting attachment; welding nozzle; cutting tip; RM-grade hose 25' x 1/4"; striker and soft-sided goggles. 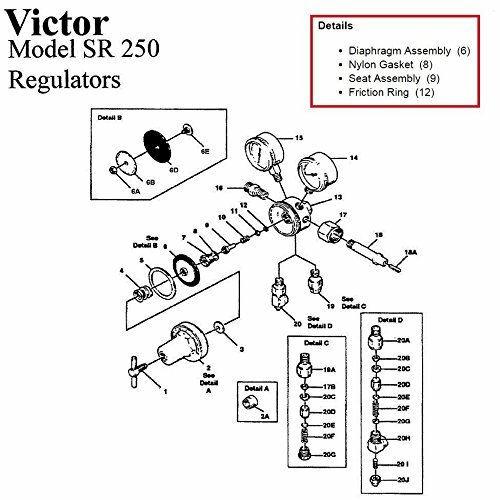 770502 Features: -All Brass Oxygen Regulator (CGA 540). 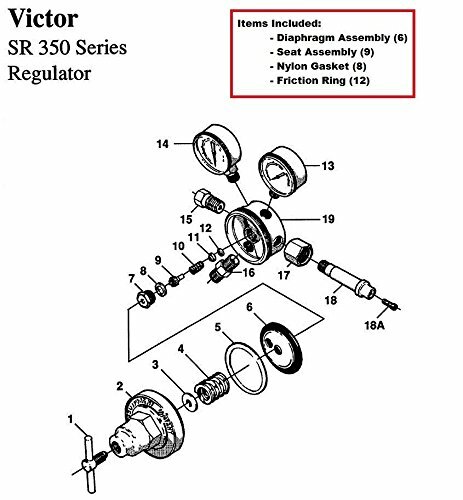 -All Brass Acetylene Regulator (CGA 510). -Durable Brass Forged Silver Brazed Torch Handle and Cutting Attachment fot Extended Life. -Reverse Flow Check Valves for added Safety. Dimensions: Overall Product Weight: -14 Pounds. This outfit is designed for use with acetylene fuel gas but can operate on propane by simply changing to propane tips. The CK Worldwide Gas Saver Kit saves up to 40% of shield gas consumption while providing better gas coverage versus the standard collet bodies. It allows up to 6 times the diameter of electrode stick out from the cup. The clear Pyrex nozzle improves visibility of the weld. 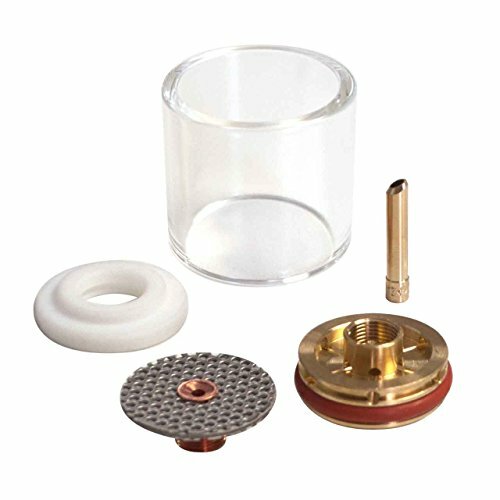 The replacement parts are less expensive than standard gas lenses making the Gas Saver Kits more economical. 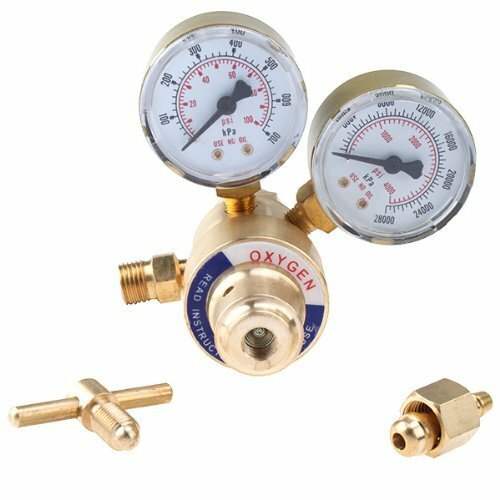 High Quality Oxygen Regulator includes 2" diameter gauges and one valve to displays accurate pressure. 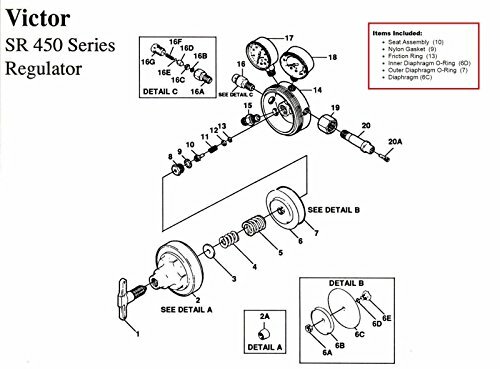 The Inlet Pressure: 0-4000 PSI and the Outlet Pressure: 0-100 PSI. Giving you more choices and convenience for your work. Handy and Easy to Operate. Easily adjust your gas flow rate with the built-in flow meter. Long Life Span for its material is copper, durable and reliable to use. Inlet thread: CGA 540 female, suits for most items. The Large Diameter Gas Saver is ideal for titanium tubing. 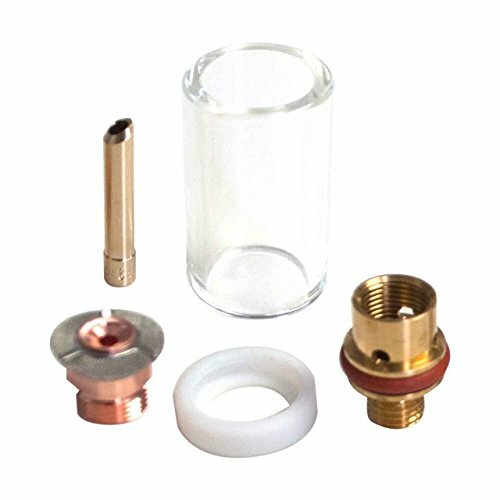 High temperature Pyrex glass gas cups insure full visibility of the weld puddle and directs a uniform gas flow pattern over a very large surface area. Features the largest diffusion screen available on the market and allows you to weld titanium at low amps without a trailing shield. 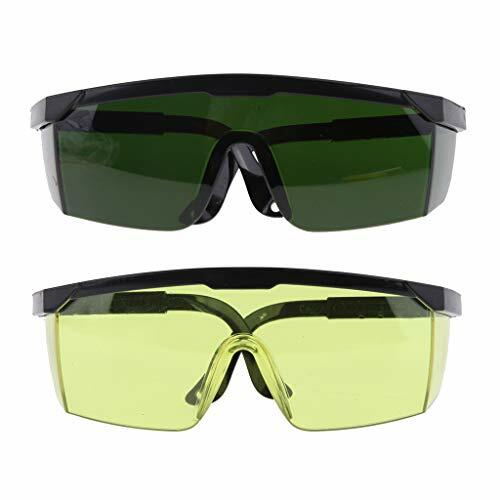 - Safety Glasses keep your eyes safe from direct and peripheral threats with a strong and durable polycarbonate wraparound construction. - Fog, glare, and scratch resistant for better visibility, also it protects your eyes from 90-100% of harmful UV radiation. - Absorbing 98%+ of blue light emitted from laptops, computers, ideal for long-time work in the office or others. - Great for woodworking and carpentry, metal and construction work, lab, racquetball,etc. Safety Glasses keep your eyes safe from direct and peripheral threats with a strong and durable polycarbonate wraparound construction. Fog, glare, and scratch resistant for better visibility, also it protects your eyes from 90-100% of harmful UV radiation. Absorbing 98%+ of blue light emitted from laptops, computers, ideal for long-time work in the office or others. Victor tote kit with tanks is a new tote design that features an ergonomic carrying handle, built-in storage case and a functional balanced design. Each outfit includes the components needed to tackle jobs from light duty welding, to specialized brazing, to cutting steel. Victor commitment to quality and safety are built into their outfits. Miller HBA30510 Heavy Duty Oxy-Acetylene Cutting Outfit. These premium heavy-duty outfits feature our proven in-tip gas mixing technology and include torch-mount flashback arrestors. 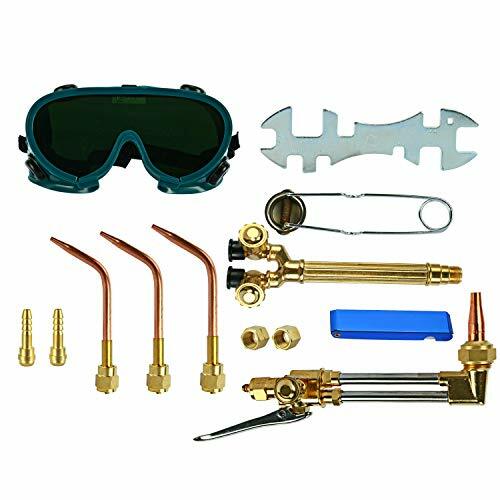 Miller heavy duty acetylene welding, cutting, and heating outfit with the following equipment; Heavy duty torch handle, cutting attachment, cutting, welding and heating tip with medium duty regulators and torch mount flashback arrestors. This Miller outfit can cut up to 8" thick metal and comes with Miller's True Blue Lifetime Warranty on the torch cutting attachment and handle. Resilient Graf-Tite seat material protects tip seating areas from nicking to maintain positive seating. Requires less replacement than metal-to-metal seat designs. Compressible soft seats are practically indestructible and withstand extremely high temperatures, resulting in longer tip life. Three-tube construction keep gases separated, eliminating mixing tube burnout. Our thick-wall, high-capacity stainless steel tubes provide high gas flow and superior strength. Internal threads are protected from damage if the torch is dropped, eliminating costly torch repair, replacement or downtime. Double-tube handle, tube-within-a-tube design provides strength while reducing weight. Internal tube is silver brazed for extra protection, strength and leak resistance. After the first tightening with a wrench, only hand tightening is required to seat the tip, saving time when changing tips. Quick and easy tip changes encourage use of right tip for the job.